Choose this Downtown San Antonio & Riverwalk location as your gateway to the city. Ideally situated in the heart of San Antonio&regs business, theatre, and nightlife district, this Downtown/Riverwalk destination hotel offers easy walking access to all of the San Antonio Downtown area attractions: the Alamo, El Mercado, the Rivercenter Mall, Henry B. Gonzales San Antonio Convention Center, Alamodome and the Majestic Theater. Every aspect of your stay at this Holiday Inn San Antonio Hotel defines our commitment to comfort and service. 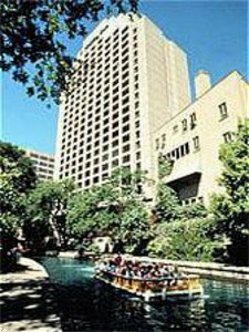 This San Antonio Riverwalk hotel features an outdoor heated pool, game room, fitness center and laundry service. Take advantage of our 24 hour Business Center, where you&regll find High Speed Internet Access, printer and online services. We offer Complimentary Wireless High Speed Internet Access in all guest rooms, meeting rooms and public spaces. Enjoy Windows on the River, a tri-level restaurant that offers a picturesque view of the Riverwalk. Entice your taste buds and join us for breakfast, lunch and dinner. Make sure to bring the whole family because at the Holiday Inn San Antonio Riverwalk Hotel kids under 12 always eat free (some restrictions apply). The Holiday Inn Riverwalk&regs central location, grand hospitality, and elegance will insure you have a memorable experience. This hotel is committed to providing accessible facilities under the American Disabilities Act. If your accessibility needs are not met, please contact the Hotel Manager on Duty. Should you require additional information regarding accessible facilities for guests with disabilities, please call 1-800-Holiday (U.S. and Canada) or contact the hotel directly. For the hearing impaired, TDD service is available at 1-800-238-5544 within the U.S. and Canada.